Complex geometries and increasing time pressure make planning and design of individual concrete components a growing challenge. The manufacture of formboards for construction of formwork for balconies, helical stairs, columns, and other structural members traditionally incurs high time and labor cost. 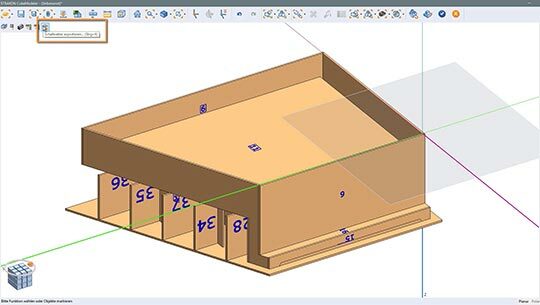 The new STRAKON formboard module from DICAD automates the manufacture of formboards and enables, for example, direct data transmission to CNC-supported production facilities. This considerably speeds up the production process in formwork construction, makes it more cost-efficient, and improves product quality. The design of a concrete element, which is imported via the IFC interface or newly generated with STRAKON, is the first step. Generation takes place either with STRAKON, is the first step. 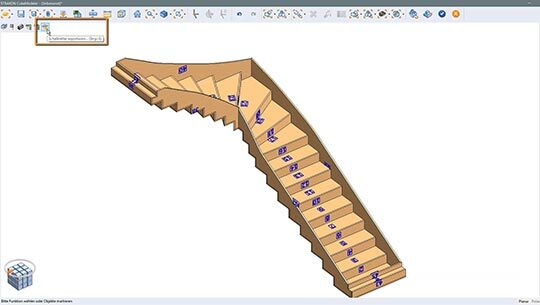 Generation takes place either with STRAKON’s many design functions or with special modules, such as the new 3D stair module for straight stairs, or for single or double quarter turns with reinforced-concrete stairs. Next, the contact areas of the given element are defined. In this step, the various views of the element are selected with the cursor. STRAKON automatically recognizes the contours of an element and generates the contact area of the form for it, with the desired thickness of the boards. In the next step, all formboards can be checked in detail and individually adjusted as necessary. An automated but flexible joint construction function also saves time. Substructures can be conveniently generated as well. Once the formwork planning is completed, STRAKON generates a transfer file for machine-supported manufacture of the formwork elements by CNC-controlled milling, which manufactures the formwork elements exactly as planned. Transfer to manual production is an option. Changes to the form of an element not only result in changes to reinforcement and formwork planning, but also to formboard planning. If changes or corrections are made in the course of planning, STRAKON automatically implements the required adjustments in all 3D drawings and for the formboards. Because formwork and reinforcement are associated by linking with the geometry of the element, adjustment to the changed geometry of the element follows automatically. Sizing, hatching, and labelling are also automatically adjusted. With the new formboard module, STRAKON consistently extends its scope of functions oriented to the requirements of practice and provides greater planning certainty, improved quality of execution, and enhanced cost efficiency. In the final analysis, precision, made-to-measure planning and automated manufacture of the formwork to millimeter precision make an essential contribution to the success of a precast plant.